Earlier this week, Sounders GM Garth Lagerwey said, to the outrage of fans, his team couldn't spend at the levels of Los Angeles, New York, Toronto and Atlanta. On Wednesday, he committed to spending at least $10 million on a designated player. Sounders general manager Garth Lagerwey made a tumultuous start to 2018 even worse on himself this week with ill-tempered remarks about his team’s financial ability that were easily his most regrettable since arriving here three years ago. Lagerwey scrambled Wednesday to undo the damage, admitting he “screwed up’’ by telling mlssoccer.com in a video interview his team’s days of being Major League Soccer’s top spenders are likely done. In the interview, which garnered league-wide attention, Lagerwey said the Sounders “punch above our weight’’ financially compared to major markets like Los Angeles, New York, Toronto and Atlanta and would have to be more efficient going forward. That raised alarm bells among the team’s diehard supporters on social media, already uneasy that a 1-4-1 squad off to the worst start in its history had added no offensive firepower ahead of Tuesday’s closing of the spring transfer window. And though Lagerwey insisted the Sounders will spend “eight figures’’ on a designated player this July and likely add another targeted allocation money signing as well, his comments aptly summarize a team at a crossroads with fans about its future direction. “I totally understand why folks would get shaken by what I said and I shouldn’t have said it,’’ a chastised-sounding Lagerwey said Wednesday. 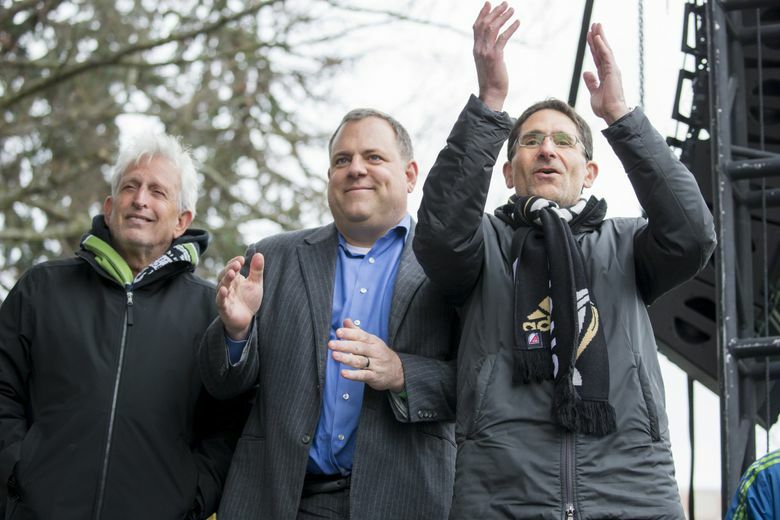 Beyond fans, Lagerwey’s remarks undoubtedly shook up majority owner Adrian Hanauer and partner Joe Roth, who’ve oft-stated their goal is to build a world-class franchise. Both abhor any suggestion money is an obstacle for them. But the reality is that despite being a top revenue team since their 2009 inception, the Sounders have steadily declined in relative spending on players. They ranked No. 7 of 22 teams in total player compensation at $10.37 million to start last season – less than half the $22.48 million spent by MLS Cup winning Toronto FC. The Sounders were No. 5 in player compensation at $10.73 million to start 2016 – again, less than half the $21.8 million spent by Toronto – and No. 4 in both 2015 at $13.3 million and in 2014 at $9.6 million. Throughout that time, they’d led the league in attendance every season until finishing No. 2 last year. They’ve also consistently ranked among the league’s top-three revenue generators, owing largely to those ticket-buying fans. So, the team’s lack of a DP signing to replace striker Obafemi Martins — who departed for China prior to the 2016 season — has chafed the fanbase. And the irritation has grown, despite the Sounders winning the 2016 MLS Cup title and finishing runner-up to Toronto last season. While player payroll typically hasn’t impacted success as much in MLS as other sports, that’s perceived by some to be changing as new salary rules have seen teams like Atlanta United FC, the Los Angeles Galaxy and expansion Los Angeles FC go on spending sprees the way Toronto already had. The Sounders mostly stood-pat this winter, claiming their 2-0 championship game loss to Toronto was an aberration and they were talented enough to contend for another title shot. But a season-ending knee injury to striker Jordan Morris has exacerbated the team’s offensive shortcomings and led to calls for it to spend more money sooner. The Sounders failed to score their first three matches, potted five goals their next two games, then got blanked again in a 1-0 loss Sunday to LAFC. Lagerwey says his plan since early February has been to spend at least $10 million in transfer fees and salary on a designated player come July, once the market reopens with more talented choices than he’d seen this spring. He says he’s fought to avoid interim “panic moves’’ despite the slow start and admits he lost his temper in the weekend interview. Lagerwey says he meant to convey that the league getting stronger in cities beyond Seattle and one or two others is a good thing and a challenge. Still, the tension of what’s gone on the opening two months is impacting the entire organization. Sounders coach Brian Schmetzer barely contained his exasperation Wednesday when discussing the fallout from Lagerwey’s comments and the growing perception of some fans and league pundits the franchise isn’t trying hard enough to win. Schmetzer said his players and coaches are doing their utmost to compete. He vowed to get rid of anyone he senses not giving a total effort.